Arlo Guthrie and family played Pittsfield's Colonial THeatre, Nov. 19, 2011. 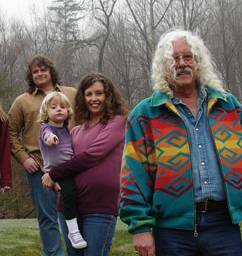 Arlo Guthrie and Family entertained a near-capacity audience at the Colonial Theatre in Pittsfield on the Saturday before Thanksgiving; he’ll play his annual Thanksgiving concert at Carnegie Hall next Saturday. The show was an ad hoc reprisal of the 2009 Guthrie Family Rides Again tour, which had everybody’s favorite folksinger accompanied by son Abe and his kids, daughters Cathy, Annie, and Sarah Lee Guthrie and husband Johnny Irion and various of their kids. On the eve of his centennary, Woody Guthrie’s musical legacy seems to be expanding at a rate even greater than the growth of his progeny, thanks to the family archive work of Arlo’s sister Norah Guthrie, who has enlisted a variety of musicians to create musical settings for heretofore unknown poems and songs found in Woody Guthrie’s notebooks. The best known examples would be the Mermaid Avenue albums by Billy Bragg and Wilco. Explaining his father’s methodology, Arlo called him a “song-stealer,” which may be another way of describing the “folk method,” where known material is there to be modified and repurposed. By way of illustration, Arlo told a story of how Woody came up with a new song in answer to a complaint from a woman that a union anthem failed to pay adequate tribute to the contributions of the ladies auxiliary. The concert’s comedy high point arrived just ahead of Arlo’s Woddstock era hit Coming into Los Angeles; in a fresh introduction, which had to deal with, among other things (as all Arlo stories do) a new shortcut from the Guthrie home in Washington to Bradley airport where wife Jackie was arrested when a little container of “a certain horticultural substance” was discovered in luggage labeled Arlo Guthrie, which was searched because the luggage checkers knew Arlo wasn’t in the boarding line, he had only dropped Jackie off and was driving back home when she phoned and then the Connecticut state police phoned with the particulars of where to retrieve his wife, who couldn’t be un-arrested but would be released. We were left to surmise that Ms. Guthrie’s legal woes ended there and then; no clue as to what became of the reefer! It was on … Los Angeles that Abe took a lead on keyboards that stunned the old man, and which would’ve felt at home in Muscle Shoals; his son Krishna’s blues chops highlighted a couple later songs. Perhaps the most affecting segment of the show was when the sisters came together to form a vocal trio for a few songs including Bring Me Little Water, Sylvie and Alabama Bound, favorites of their grandfather’s friend Lead Belly. On a more humorous note were a couple “inappropriate” songs by Cathy, who tours and records with Willie Nelson’s daughter Amy as Folk Uke. In addition to being hilarious, she sings beautifully, reminding me of Iris Dement. Official honorary Guthrie family member Terry A La Berry (nee Hall) kept the generations on time with his artful drumming. In the audience were his mother, playwright and teacher Frances Benn Hall, who has been reviewing plays here for eleven years. More about Arlo Guthrie – concert reviews, photos and an interview.